On September 9th, The Hollwood Reporter addressed the fact that I have provided information to the U.S. Trade Representative in relation to a company subsidy scheme in Canada (read). 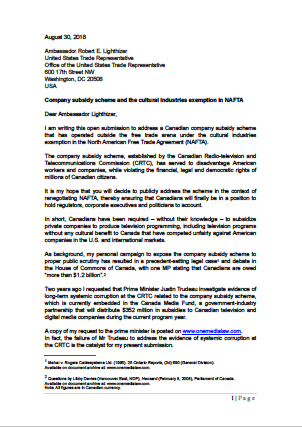 My submission to Ambassador Robert E. Lighthizer documents that Canada has exploited the cultural industries exemption in the North American Free Trade Agreement for over twenty years. 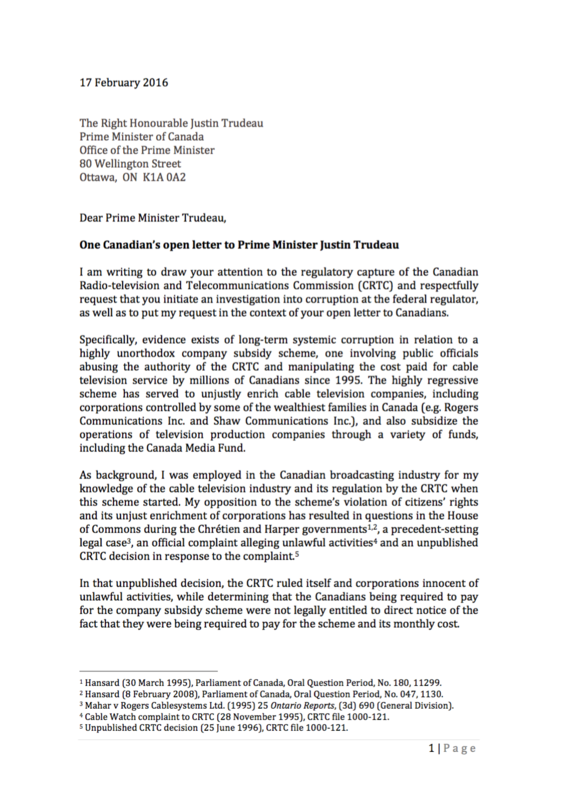 The catalyst for the submission is Prime Minister Justin Trudeau's failure to initiate an investigation into evidence of long-term systemic corruption at the Canadian Radio-television and Telecommunications Commission in relation to a highly unorthodox scheme, one that has exploited millions of ordinary citizens and unjustly enriched corporations controlled by some of Canada's wealthiest families, including Rogers Communications Inc. and Shaw Communications Inc.
At issue is a company subsidy scheme that started with the Cable Production Fund and which is currently embedded in the Canada Media Fund, 'a government-industry partnership'. The scheme is documented in One Media Law and Profiteering in the Name of Culture, which are available on this website. 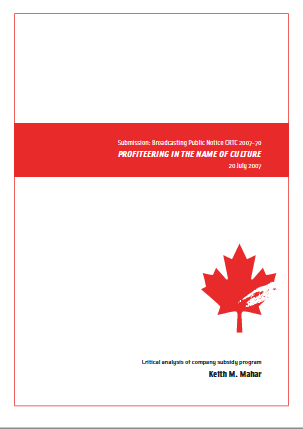 The Document Archive on this website contains a number of documents related to the scheme, including copies of several documents formerly stored in CRTC file 1000-121. 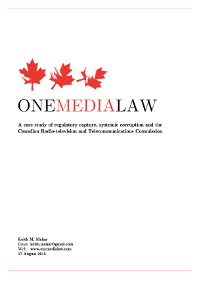 That CRTC file was destroyed in 2006 after my lawyer specifically identified its existence to politicians in relation to my allegations of corruption. A copy of an unpublished CRTC decision is one of the CRTC file 1000-121 documents available to review. In effect, the CRTC ruled that Parliament has granted it the authority to require Canadians to unjustly enrich and subsidize private corporations and that these same citizens are not legally entitled to know that they are being required to unjustly enrich and subsidize the companies. "[Mahar] fought with a passion against the cable companies and the CRTC for citizen/consumer rights - and his fervour cost him his career as well as his emotional and mental health. An activist David against the media Goliaths, he didn't have a chance against the all-powerful cable monopolies and their allies in Ottawa." - Antonia Zerbisias, The Toronto Star, 6 February 2007 (read). Maybe the media columnist's assessment was correct at that time. However, if the U.S. takes exception to Canada's unfair competition and trading practices, Canadians will finally be in a position to hold corporate executives, federal regulators and politicians to account.